If you have bookmarks to the old site, please change them to the www.varmintal.com site. VARMINT AL.... Mary Ann and I moved to Bethel Island in 1971 and we both retired in 1990. Mary Ann taught Kindergarten for 26 years in Brentwood. I worked for 30 years at the Lawrence Livermore National Laboratory. For most of that time, I worked performing engineering structural analysis on complex systems. The example calculation is a 2D Implicit Finite Element Analysis (FEA) of a 10-32 Grade 8 socket head cap screw being loaded to its breaking point. The graphics shows the deformations and the resulting strain levels. Note the large amount of plastic deformation before the cap screw fails. The FEA software used was the LS-DYNA Finite Element Code. The number crunching took about 5.5 minutes of CPU time on my Athlon II X4 computer. There are more examples with the latest LS-DYNA software on my Engineering Page. A 10-32 Grade 8 socket head cap screw being pulled to failure. This is a 2D simulation with MAT_018 including failure strain. elements are removed from the mesh. More details on my Engineering Page. SITE NAVIGATION.... This site is composed of many separate pages so that they will load faster. Most pages have many pictures that do take awhile to load. I have tried to include interesting text information at the top of each page that the viewer can read while the rest of the page is loading. Often browsers will time out before loading a complete page and some of the pictures will show at the dreaded red x, . If this happens, merely refresh the page and the remaining pictures should load. Each paragraph has a title in BOLD that quickly identifies its subject. There is an identical site Index Table at the top left of each page to aid navigation. 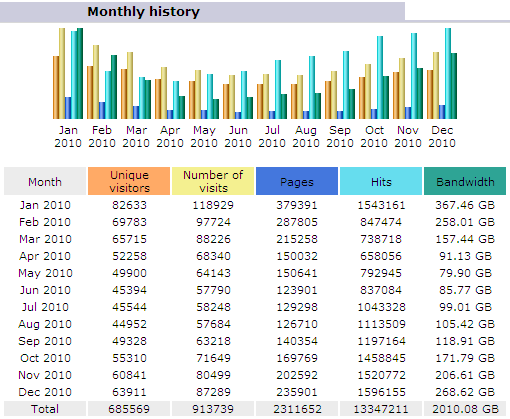 Most pages have a Link at the bottom that takes you to that particular subject on my big Links Page. The Links page lists all of these links sections on a single page plus even more links. There is a Latest Updates Page that identifies major changes to the site. 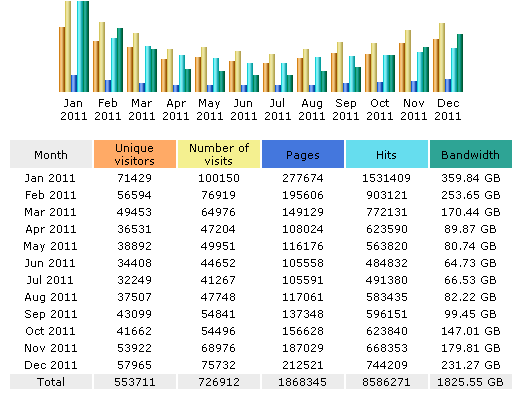 that a page on my site was viewed somewhere in the world every 13.6 seconds. NO ADS & NOTHING FOR SALE.... Well, I don't sell anything, but the traffic is so large, I had to upgrade the page's bandwidth again. There are no ads or pop-ups to annoy. I have added a Sponsors Page for a few companies that I have done business with and am pleased with their products and service. I don't sell anything on these web pages and there are no pop-up ads to annoy the viewer. Since I am not selling anything, I can openly discuss any item or subject without worrying about sales. I created these web pages because I enjoy hunting and fishing and want to pass along that enjoyment. I have a two domains, http://www.varmintal.com and http://www.varmintal.net with Globat. 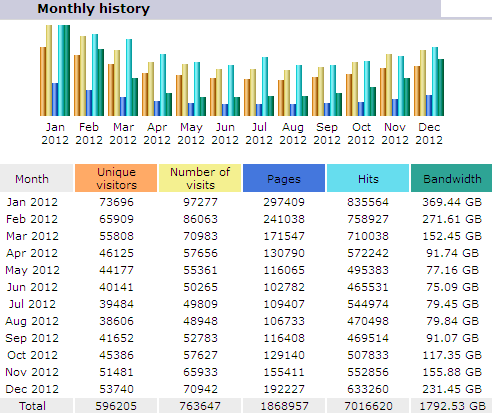 Each domain can handle 1 Tb/month of traffic. HOW AM I PAID?.... Every time a youngster writes me email and tells me he is enjoying hunting and shooting because of something I have written, that is enough payment for my effort in making these pages. I must confess that I do have a link so a person can buy online metals for their lathes and mills. I get a small commission if someone links from my web page to buy metals. I also get a small fee if someone signs up with www.globat.com for a web hosting site. It looks like I am going to break even and the web page will pay for its self and all of the traffic. 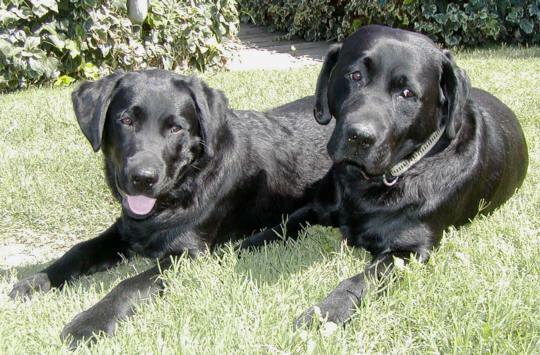 Here are Father & Son, Bart and Tide, our Black Labrador Retrievers. 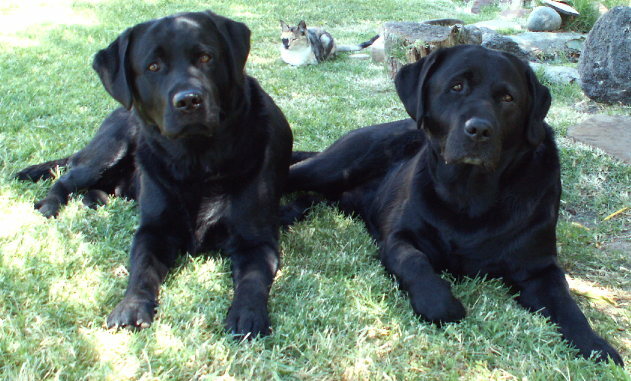 Bart has a CDX and JH Title and is a happy dog and a pleasure to train. Bart is an excellent hunter and knows pheasants. Tide is now 2 years old and doing fine. 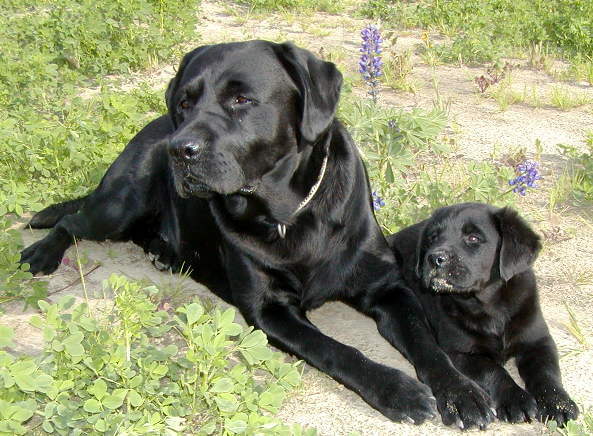 Tide as he was growing up. Tide is now taller than Bart. Tide does not have white hair on his chest. That is sunlight shining through the leaves of the tree. That is Camo Cat in the background. Max has since gone over the Rainbow Bridge. My Ham Radio call sign is WB6YNM and I have had my Ham License since 1972. I assembled our old Pentium 200 MMX Computer from parts and have run a benchmark NIKE2D Finite Element test of the FPU's execution speed on it and a number of other computers. I now have numerous computers all assembled from parts and I install the Linux Mint software from an .iso file. I have stopped using the Windows operating system. 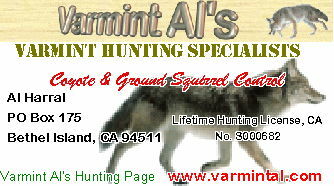 Click on my Varmint Hunting "Business Card" to go to my Hunting Page. Thank you for visiting my Web Pages. I hope you found some useful information and enjoyed your visit. Please continue to support the Constitution and the Second Amendment. 2 : composed of elements drawn from various sources.